Helton DaSilva knows how to work a room. The 26 year-old native of Brazil is currently the Executive Chef at Barcelona in Fairfield, but his talents expand beyond the kitchen. Earlier this week, I had the pleasure of watching him in action, courtesy of CTBites Invites. It was a chef demo and lunch, and the ladies who were lunching met Chef Helton’s enthusiasm and raised a flirt or two. “Are you married?” one woman ventured after the chef had introduced himself, much to the tittering pleasure of the crowd. And this was before sangria was served. 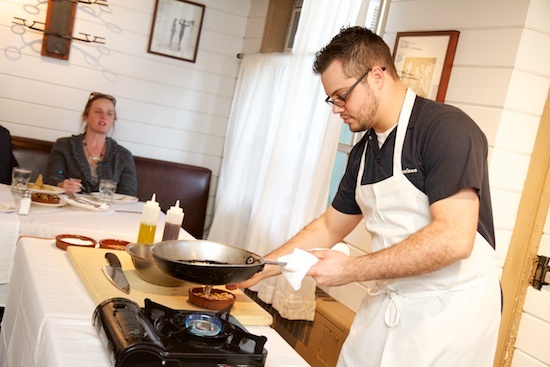 The demo lunch was a mix of insider tips and delicious dishes with more than a dash of Chef Helton’s charm thrown in. In fact, most of the women there seemed to be torn as to whether they’d rather have Chef Helton cook for them or sit down to lunch with them. Read the full recap by Meaghan Morelli on The Daily Westport.